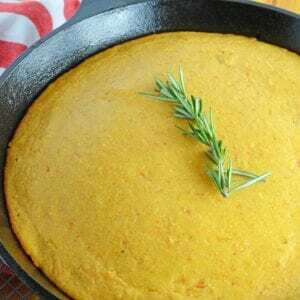 Sweet Potato Cornbread is a sweet combination of two of my favorite fall foods: sweet potatoes and cornbread. It also uses my love of cooking in cast iron, so really, Sweet Potato Cornbread is the perfect recipe. Preheat oven to 375 degrees. Lightly grease a large cast iron skillet (butter or vegetable oil). Whisk together cornmeal, flour, baking powder, baking soda, salt and pumpkin pie spice (optional). Set aside. In the bowl of a stand mixer fitted with the paddle attachment or large mixing bowl, beat eggs. Add sweet potatoes, yogurt, buttermilk, dark brown sugar, butter and honey. Mix until combined. Do not over mix. Add dry ingredients and mix until all batter is wet. Do not over mix, this will result in tough cornbread. Pour batter into prepared cast iron skillet. Bake for 30-35 minutes. Test using the toothpick test. Serve with Cinnamon Honey Butter.